Who would’ve thought that with all the disasters that have happened in the NFL this year (Ray Rice, concussions, etc.) the Super Bowl would be taken over by talks of ball pressure. Did the Patriots knowingly deflate their balls?! Are they certifiable cheaters?! I’d be shocked if we ever find out the true answer to this. A) Provide the balls for each game if they want the balls to be uniform. Teams should not be allowed to provide their own balls. B) If teams are allowed to provide their own balls, they should be able to do whatever the heck they want to them! If one team likes their balls at a different pressure or scuffed up, so what? There are already so many variables that go into a football game, why spend so much energy caring about this one? If anything, it would probably just lead to more scoring which the NFL loves anyway. Either way, I’m already very sick of the whole thing. Instead of talk about something deflated, I wanted to eat something deflated. So I made flatbread. These beauties don’t have any yeast in them so they stay non-puffed and turn into crispy, cracker-like crusts. Topping options are many, but I really like the Mediterranean spread I went with here. 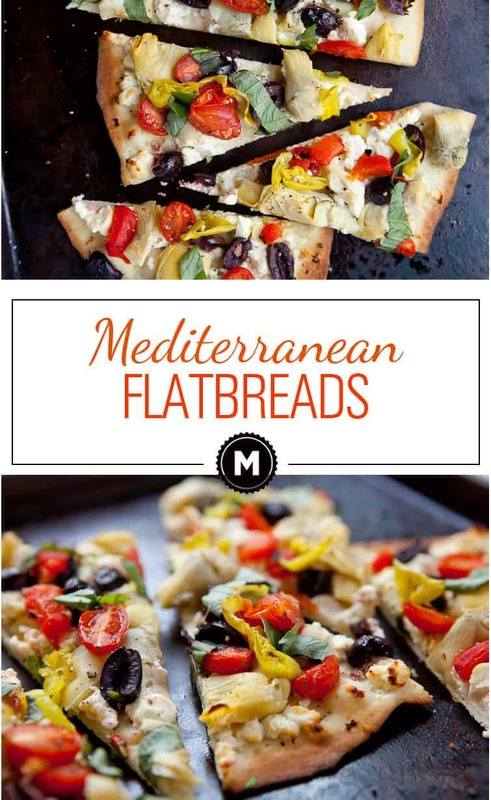 My favorite no yeast flatbread recipe topped with loads of Mediterranean toppings. A perfect appetizer or meal! 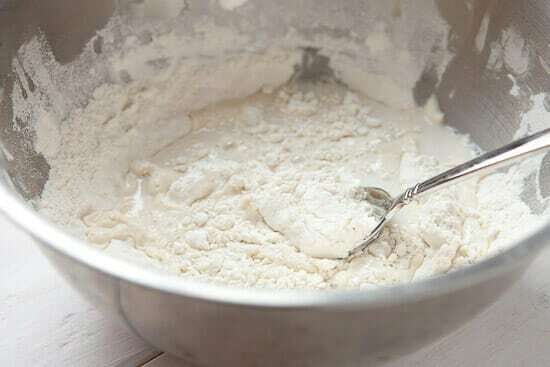 To Make Dough: Stir together all ingredients in a medium bowl. Use your hand to knead the dough lightly until it forms a soft, smooth ball. If at any point the dough is very sticky, add a bit more flour. Knead the dough for 5-6 minutes. 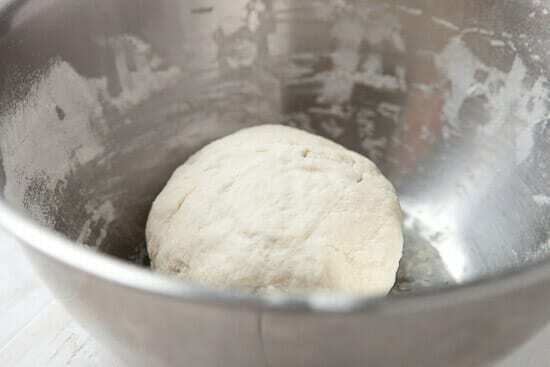 After dough is in a smooth, soft ball, cover with plastic wrap and let sit for a few minutes. 1) Preheat oven to 425 degrees F. Cut dough in half and roll each half out on a lightly floured surface. When dough is rolled out into a roughly 8×12 rectangle, transfer it to a baking sheet. 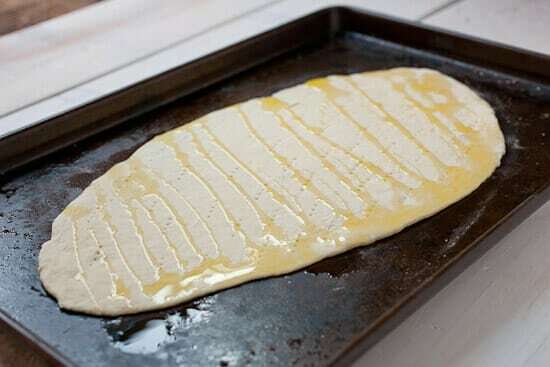 2) Prick the dough with a fork all over and drizzle with olive oil. 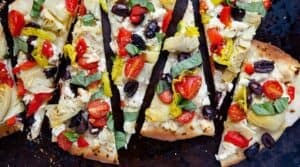 Top dough with any toppings you are using (except for basil). If you’re toppings are kept in brines (olives, artichokes, etc.) then dry them off well before adding them to the flatbread. Season with salt and pepper. 3) Bake the flatbreads for 12-15 minutes until browned and crispy around the edges. 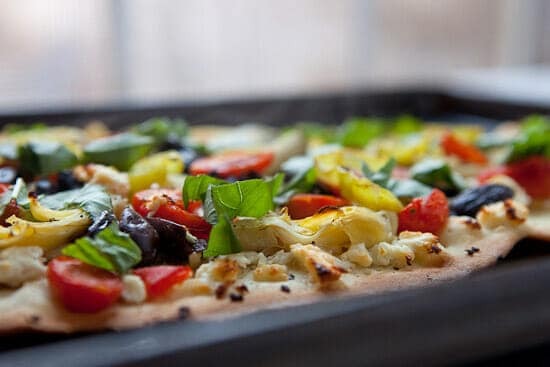 4) Remove flatbreads from oven and sprinkle with fresh basil. Slice and serve while warm! Many times, I’ll just use pizza dough for flatbreads and that sort of blurs the line between the two. But these guys are noticeably different from pizza. Because there’s no yeast (and just a tiny amount of leavening from baking powder), the crust gets really crispy. It’s basically a sturdy cracker that can hold up to loads of toppings. Another bonus of leaving out the yeast is that it’s really easy to make! Start the dough just by stirring together all the ingredients. While you could bust out the stand mixer for this, I think it’s more work than it’s worth. The dough is really easy to knead by hand and you just need to knead it until it forms a soft, smooth ball. It should only take 5-6 minutes of kneading. As always, if the dough is really sticky, add a bit more flour. This was my finished dough! The dough doesn’t need to rise, but it does help to let it rest for 10 minutes or so while you preheat the oven and stuff. Letting the dough rest will make it easier to work with. When you’re ready to make the flatbread, cut the dough in half and roll each half out on a lightly floured surface. Each half should be roughly 8×12 inches but there’s no set size really. You just want the dough nice and thin. 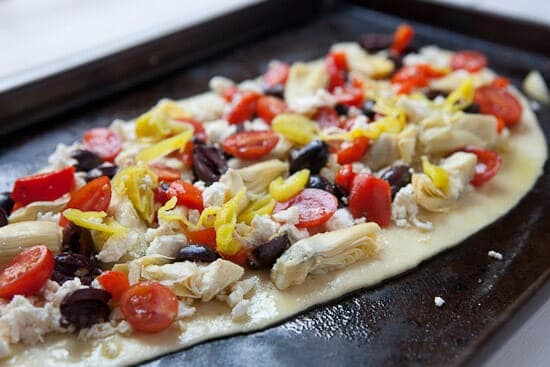 Then transfer the dough to a baking sheet and poke it with a fork (to let steam out as it bakes) and drizzle it well with olive oil. Let’s talk fun toppings. 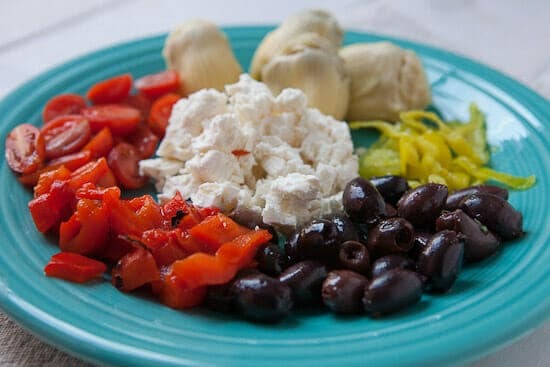 I went with a Mediterranean skew here so I chopped up some olives, artichokes, roasted red peppers, cherry tomatoes, banana peppers, and crumbled up some feta. You can really pile this stuff on the flatbread. It’ll hold up to the toppings. ONE BIG TIP: For the ingredients that are kept in brines (artichokes, olives, etc.) dry them out on a paper towel before adding them. If you don’t dry them out there will be a lot of liquid on the flatbreads which won’t cook off and you’ll end up with a soggy situation. Bake this guy at 425 degrees F. for 14-15 minutes until the edges are nice and crispy. Some of the veggies will get a bit crispy around the edges which is a bonus. When the flatbread comes out, sprinkle with fresh basil! These are really excellent and would be a nice switch up from some of the standard Super Bowl foods tomorrow. If you do need a standard recipe though, make these wings. I’ll be making them for sure! Okay… I could end this post without giving a prediction. I think it’s going to be a close game and a good one, but I think the Pats are the slightly better team. I’ll say Pats win 24-21. Have a Super Bowl prediction? Leave a comment! These look great Nick & I love the vibrant colour of your topping! I am thinking the toppings could be endless: simple mozzarella; gorgeous summery tomatoes; avocado & corn; caramelised onions; prosciutto, fig & goats cheese; salsa… oh dear, I’m hungry now! Due to the time difference here in Australia, we actually end up with Super Bowl Monday from about 10am! Just the 2 of us watch it so I don’t make a lot of food. Hubby makes an awesome fresh salsa which we eat with corn chips & veggies. I’m also thinking of adding either a cheese dip or some chicken wings for something hot. I wish we could get Franks hot sauce here! I love the onion, prosciutto, fig, goat cheese combo! Sounds awesome. Franks is definitely a standard and it’s hard to imagine wings without it! First about the recipe — looks fabulous. Thanks! About the Super Bowl — all of your comments are spot on. I’m hoping Seattle wins; however, I think that the Pats will win by more than three. I just swapped 1 of the cups of AP flour for a cup of bread flour and used it as I normally would for cast iron pizza. It worked fantastically! Total game changer when I can have a great dough ready from scratch in under 20 minutes. Thanks! For the record, this dough works phenomenally well for making pizza on the grill! Can I make one flat bread pizza and freeze the other dough ball? Hey Kate! I haven’t personally tried freezing this dough, but generally dough freezes pretty great. I don’t see why it would be a problem. Just thaw it slowly in the fridge when you want to use the extra. Good luck! Every time I’ve made this lately I’ve been doubling the recipe, then portioning out and freezing the rest. It’s a great backup dinner base for those nights when you’re short on time/energy/cash-for-takeout. Obviously not a hugely time consuming dough to begin with, but all of this is to say it freezes great.